The now infamous Flappy Bird game caused a real stir recently when its creator pulled the app, seemingly due to criticism about its addictive nature. Today we have details of a new app called Flying Horse, which is claimed to be as addictive as Flappy Bird. Many people were aghast to find that Flappy Bird was no more, prompting a flood of alternative apps offering a similar kind of experience. The game’s creators Tycero AB say that Flying Horse is just as addictive but also features epic music and beautiful graphics. This new arrival to Google Play and the App Store is a free app and players have to tap to fly and avoid obstacles along the way (remind you of anything)! Points can be gained across various levels of difficulty, including an Impossible mode, which sounds like a real challenge. The custom mode enables users to change the speed and ‘flap power,’ and bid to get a place on the leaderboard. Results can also be shared via Facebook, Twitter, Email or SMS. The game is receiving excellent ratings so far with some users rating it as better than Flappy Bird or the many other clones of it! If you want to try out Flying Horse for iOS devices head to iTunes. This version of the app is compatible with iPhone, iPod touch and iPad running iOS 5.1 or later. 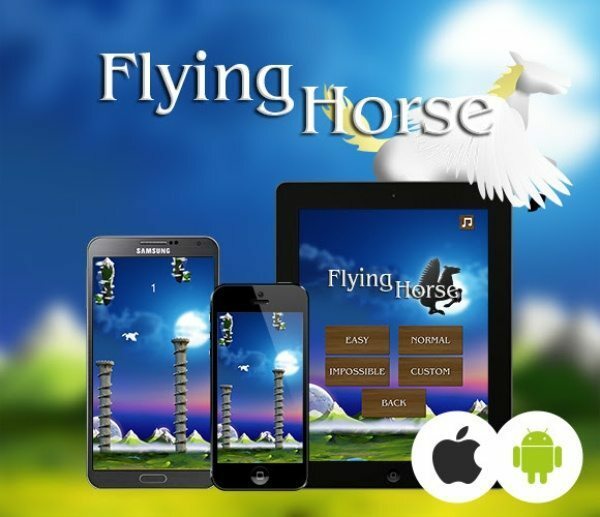 Alternatively you may want to check out the Android version of Flying Horse from Google Play. This app is also free and is suitable for devices running Android 2.2 or later. If you decide to download Flying Horse we’d really love to hear your opinions on this new gaming app? If you’ve also played Flappy Bird do you find Flying Horse just as addictive or not?